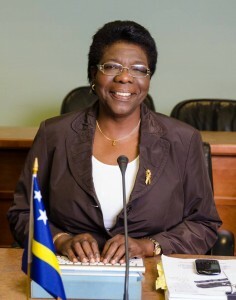 WILLEMSTAD - According to the Independent Member of Parliament, Omayra Leeflang, Prime Minister Ivar Asjes must repay the ticket of his wife for the visit to China paid by state funds. She stressed that this is only permitted under the policy when she is invited. "This was not the case, " says Leeflang. “The Consul General of China sent an invitation to stakeholders.” This was as clear to her in a letter of invitation handed over by the Prime Minister to parliament. This would, according Leeflang have been no reason to take Tara Asjes-Prins to China. The Independent MP now is demanding clarification on this issue and wants Asjes to repay the money.